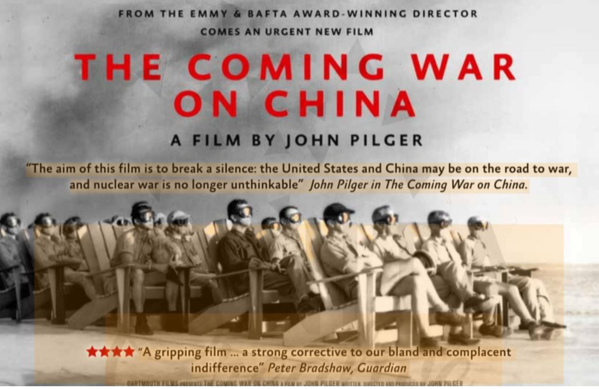 On Thursday April 4, 2019 the Marrickville Peace Group hosted a presentation of John Pilger’s 60th documentary ‘The Coming War on China’. The event was held in the Stirrup Gallery at the Addison Road Community Centre in Marrickville. MPG is staffed by volunteers. Donations are most welcome - they will assist with admin, website, event & publication costs and in promoting a culture of peace with justice. A brochure on MPG can be downloaded here. It contains our Mission Statement and information about who we are, our history and how you can participate in our activities and campaigns. (To print, select 2-sided/booklet in printer properties). James O’Neill, 'Australian defence strategy still locked in a past era', Pearls and Irritations - John Menadue's blog, Mar. 28, 2019. Nick Deane, 'Thoughts on the Schools Strike for the climate', Pearls and Irritations - John Menadue's blog, Mar. 20, 2019. Emma Snaith, 'Rahaf Mohammed al-Qunun: Saudi teenager lands in Canada after country grants asylum', The Independent, Jan 13, 2019. Gem Romuld, 'Labor sets the right course on nuclear disarmament', SMH, Dec 27, 2018. Patrick Cockburn, 'How anger in Washington over Khashoggi's murder has led to progress in the Yemen conflict', The Independent, Dec 14, 2018. Douglas Newton, 'For Armistice Day: Lest we forget the realities of the Armistice', Pearls and Irritations - John Menadue's blog, Nov 9, 2018. Kathryn Kelly, 'Armed Neutrality for Australia? ', Pearls and Irritations – John Menadue’s blog, Jun 13, 2018. Julian Burnside, 'The legality of off-shore detention', Pearls and Irritations – John Menadue’s blog, Jun 13, 2018. Saul Eslake, ‘The quest for ‘security’. Is it rational? Has it made us safer? And at what cost?’, John Menadue’s blog: Peals and Irritations, Feb 23, 2018. Yanis Varoufakis - Interview on Julian Assange's arrest in the UK. Yanis Varoufakis, Greek economist, academic and former Finance Minister for Greece, discusses the serious issues that Julian Assange's arrest raises in relation to freedom of the press. ABC's Lateline with Phillip Adams, Apr 15, 2019. Don Rothwell - Interview on Julian Assange and the legalities of extradition. Julian Assange has had his asylum seeker status revoked by Ecuador and was arrested by British police on April 12, 2019 for "failing to surrender to the court" over a warrant issued in 2012. The US is seeking his extradition. This interview discusses the legalities of extradition by the US of an Australian citizen, held in the UK. ABC's Saturday Extra program with Geraldine Doogue, Apr 13, 2019. Sujatha Fernandes - Interview on the current political tensions in Venezuela including a discussion of an open letter that calls for an end to US interference in Venezuela and for negotiations to take place between the Venezuelan government and its opponents. ABC's RN Drive with Patricia Karvelas, Jan 30, 2019. 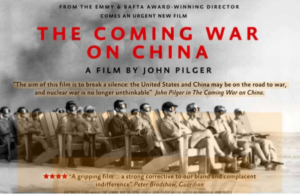 Douglas Newton - Interview on the real lessons of World War 1. There will be sincere and solemn events held during the Centenary of the Armistice of 1918. But prepare also for a hurricane of media puffery, a cascade of clichés, narrow nationalism, the familiar medley of cheers and tears. In contrast this interview focuses on the real lessons of the First World War. Radio SkidRow, Close to Home with Colin Hesse, Nov 8, 2018. Richard Tanter - Interview on the war in Yemen. Discusses a UN report which accuses Saudi Arabia and the United Arab Emirates of war crimes against civilians. Also discussed is the growing military relationship between Australia and United Arab Emirates. Critics warn that this could involve Australia in a wider conflict with Iran. ABC RN Breakfast, Sep 3, 2018. Noam Chomsky, 'Arrest of Assange Is “Scandalous” and Highlights Shocking Extraterritorial Reach of U.S..', Democracy Now!, Apr 12, 2019. Transcript included. Noam Chomsky, 'Members of Migrant Caravan Are Fleeing from Misery & Horrors Created by the U.S.', Democracy Now!, Nov 2, 2018. Transcript included. Apr 20, 2018 - Letter to Senator Marise Payne, Minister for Defence, on the dangers of stationing US Marines in Darwin. Dec 15, 2017 - Response from Office of Senator Marise Payne, Minister for Defence, justifying the stationing of US Marines in Darwin. Refer to letter below dated Nov 6, 2017. Nov 30, 2017 - Letter to Prime Minister Malcolm Turnbull calling for diplomacy not war on Korean Peninsula. Nov 21, 2017 - Letter to Justice Reeves, NT Supreme Court, pleading clemency for Pine Gap Peace Pilgrims. Nov 6, 2017 - Letter to Senator Marise Payne, Minister for Defence, opposing the stationing of US Marines in Darwin. Oct 21, 2017 - Letter to Sydney Morning Herald on Foreign Minister's response to letter from North Korea. Aug 16, 2017 - Letter to Israeli Ambassador protesting the confiscation by Israeli authorities of solar panels providing electricity to two villages, Jubbet al-Dhib and Abu Nuwar, near Bethlehem. Aug 14, 2017 - Letter to Prime Minister Malcolm Turnbull on North Korea. May 2018 - Submission by MPG to the Joint Select Committee on Constitutional Recognition Relating to Aboriginal and Torres Strait Islander Peoples. Mar 2018 - Submission by MPG to Joint Standing Committee on Foreign Affairs, Defence and Trade’s Inquiry into the benefits and risks of a Bipartisan Australian Defence Agreement. Nov 2017 - Submission by Medical Association for Prevention of War (MAPW) to Joint Standing Committee on Foreign Affairs, Defence and Trade’s Inquiry into the benefits and risks of a Bipartisan Australian Defence Agreement. Feb 2017 - Submission by MPG on the Foreign Policy White Paper.